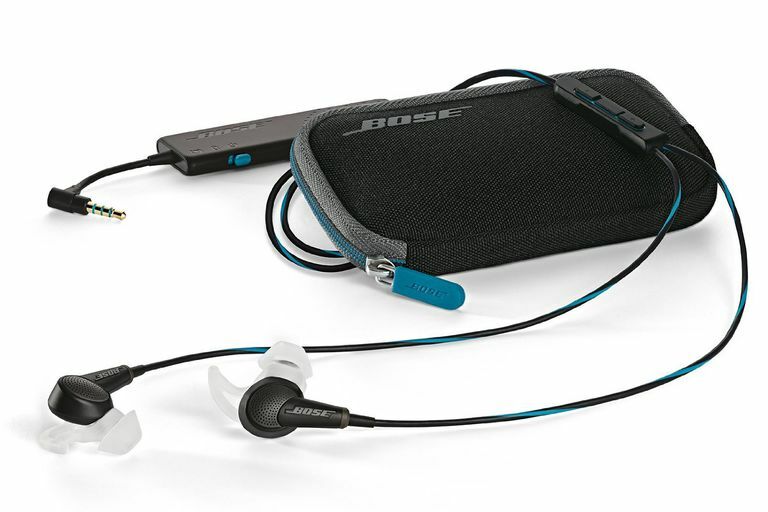 The Bose QC-20 offers portable yet powerful noise cancellation. Many audio manufacturers offer headphone/earphone models with active noise cancellation (ANC) technology. These are ideal for people who listen to music or watch videos in noisy environments and/or while traveling. However, not all ANC is created equally. We take a look at how the Bose QuietComfort 20 (QC-20) acoustic noise cancellation earphones perform. The sensitivity of the QC-20, measured with a 1 mW signal at 32 ohms (standard impedance calculation for internally-amplified headphones like the QC-20) is 104.8 dB, high enough to get loud levels from probably any source device. Left channel represented in blue, right channel represented in red. Frequency response of the QC-20 in left (blue) and right (red) channels, test level referenced to 94 dB @ 500 Hz. There is no standard for what constitutes a "good" frequency response in headphones, and because psychoacoustics is complicated and ear shapes vary, the correlation between objective response measurements and subjective listening impressions sometimes isn't clear. However, this chart does let you compare models objectively. The QC-20 shows a little less bass response than most in-ears, which tend to have a bump in bass output around 100 Hz. It also shows a somewhat more prominent treble response, with a lot of energy between 2 and 10 kHz. The response is essentially identical in both modes for the QC-20. Frequency response of the QC-20, right channel, with noise canceling on (red trace) and off (yellow trace). As you can see, the response is essentially identical in both modes. This is the best result we have ever measured on this test. Every other noise-cancelling headphone tested changes its response at least a little when noise cancellation is switched on; sometimes the change in sound is dramatic (and annoying). Long blue streaks indicate resonances. Spectral decay (waterfall) plot of the QC-20, right channel. Long blue streaks indicate resonances, which are generally undesirable. Not much to worry about here. Just a very, very narrow (and thus probably inaudible) resonance around 2.3 kHz. The QC-20 works well with low- and high-impedance amplifiers. Frequency response of the QC-20, right channel, when fed by an amp (Musical Fidelity V-Can) with 5 ohms output impedance (red trace), and with 75 ohms output impedance (green trace). Ideally, the lines should overlap perfectly, and here they do; which is usually the case with internally amplified headphones like the QC-20. Thus, the QC-20's frequency response and tonal balance won't change if you use a low-quality headphone amp, like those built into most laptops and cheap smartphones. Distortion of the QC-20 is very low. Total harmonic distortion (THD) of the QC-20, right channel, measured at a test level of 100 dBA. The lower this line is on the chart, the better. Ideally it would overlap the bottom border of the chart. Except for that strange little 4% distortion peak at 600 Hz, the QC-20's distortion is very low, especially in the bass. Noise cancellation off (green) and on (purple). Isolation of the QC-20, right channel, with noise cancellation off (green trace) and noise cancellation on (purple trace). Levels below 75 dB indicate attenuation of outside noise (i.e., 65 dB on the chart means a -10 dB reduction in outside sounds at that sound frequency). The lower the line is on the chart, the better. At higher frequencies, the noise cancellation effect is good, about -20 to -25 dB. In the lower frequencies, where the noise from jet engines resides, the result is the best we can remember measuring, as good as -45 dB at 160 Hz. That's equivalent to a 96 percent reduction in sound level. Note that the purple trace hits the bottom of the chart. The closer to a completely flat line, the better. Impedance of the QC-20, right channel. Generally, impedance that is consistent (i.e., flat) at all frequencies is better, but with the very high impedance of the QC-20's internal amplifier input, this is not a concern.